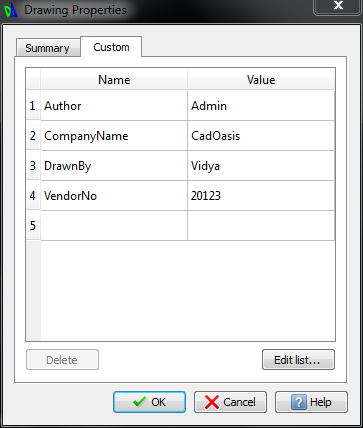 This article shows how to create Drawing File Properties . There are saved in Drawing only . You can check them on this dialog box. Custom Properties List will be shown in FIELD command Name section also. Here you can enter details such as : Author, Comments , Title , Subject in Drawing file. Statistics: This section shows Drawing Created, Last saved , and user name who Last saved the Drawing file when you save Drawing file. Here you can add details based on your Custom list in name drop down list or You can type text directly in these cells , if press Enter it will create new row below. To edit this Custom list click on ‘Edit list…’ tab. 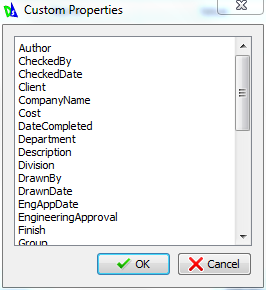 It will open Custom properties, you can edit/delete this list or you can add new items in this list same as text file. 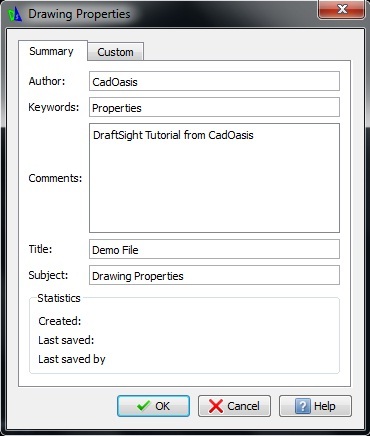 Is it possible to import/export the custom drawing properties in Draftsight? I believe AutoCAD does this through the PROPULATE command. Thanks. Till DraftSight 2015 there is no command or function similar to PROPULATE in DraftSight. Did you find a solution to import the drawing properties?